Paradigmeers | What More Can There Be? Transcript from an advert for Apple about 2o years ago. This entry was posted in Antics, creativity, Dave Bradley, Dave Bradley Speaker, Paradigmeers, Talent Development, think differently on March 15, 2013 by Dave Bradley. I have a fascination with people, situations, products and historical events which have changed the way we live. Let’s be a bit controversial today. 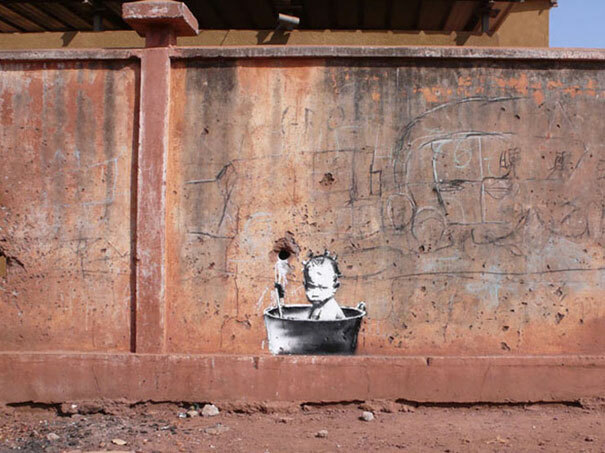 Banksy is a graffiti artist who likes to keep his identity anonymous. He wasn’t the first Graffiti artist, I think we have to attribute the creation of the genre to our ancestors who crafted images upon the walls of caves. In fact he didn’t even invent modern graffiti which achieved popularity / notoriety with the rise of hip-hop in the 1980’s. He didn’t create the stencil technique and style used for many of his pieces; this has been attributed to French artist Blek le Rat. No, what makes Banksy a Paradigmeer is he has made this type of expression popular. Ask many graffiti artists what they think of Banksy’s work and they retort that he has ‘sold out’. Ask art critics for an opinion and they are dismissive. Ask some people and they say it is just vandalism and encourages others to deface public property. 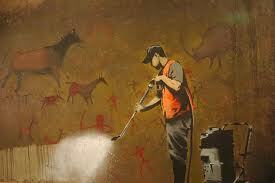 Ask an art teacher and they will tell you Banksy has encouraged people to create art. What he has done is to challenge the rules of art and political expression in a way that has captured the attention of a wide audience. Most importantly he has made it accessible and acceptable. 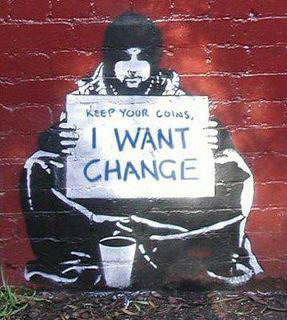 With so many people involved in addressing structural change there are some basic principles which have proved successful for Banksy. 1. Clearly identify what you want to improve. 2. Put your intention out there for all to see. 3. Make it accessible to all, so they can become involved and help to shape the future. 4. Have a strategy for coping with your critics. Critics are protective of the status quo. 5. Use humour to temper emotions in order to allow your communication to become constructive. 6. Park any ego. The art, the message, the customer, the patient, the issues which need addressing are more important than status and ego. 7. Be passionate about what you are doing. It has to mean something to you otherwise why should it mean anything to anyone else. This entry was posted in Change, Paradigmeers on January 31, 2012 by dave5621. I recently discovered a bundle of old exercise books. As I untied the string which bound the collection I noticed they were a relic of my schooldays. What struck me as I thumbed these seminal tomes of my intellectual development, was the smudged handwriting. Blotches of ink, inky fingerprints and other ink related schoolboy catastrophes highlighted each page. I was the product of a schooling system which insisted that the ballpoint pen was bad for the development of fine calligraphy! Luckily the invention of Laszlo Biro has prevailed. His name is synonymous with the ballpoint pen even though this had been invented 50 years before Biro’s 1938 patent. Marcel Bich bought the patent in 1950 before spending two years perfecting his iconic Bic Crystal ballpoint pen. So successful was his product that 57 Bic Biros are sold every second amounting to 100 billion since 1950. There can be hardly anyone on the planet that isn’t familiar with it. 1. When we consider that for years the Bic Biro was the tool we used to express ourselves. How many of the world’s great ideas started their lives as a line of blue or black ink scribed onto paper by the ball of a Bic Biro. 2. Did it challenge the rules? I would argue it did. Previously pens were relatively expensive and required skill to use. The biro opened up the world as a cheap, reliable tool that anyone could use. 3. It has popular appeal. Even today as electronics usurp the written word we still carry a ballpoint pen to fill those gaps when only pen and paper can be useful. 4. We couldn’t imagine a world without the biro or its many spin offs. Even, I would suggest in a hundred years time, there will still be biros in use. When your ‘i’ this that and the other, has become obsolete, still tucked away in your desk drawer will be a ubiquitous biro. I look at my desk now, as I type into my super clever computer, beside me are notes, diagrams, doodles and drawings made using a small army of biros. My schoolbooks are testament to what life was like without the Bic biro. We can only speculate that given the ease with which words, thoughts and ideas could be generated it is possible that without the ballpoint pen we wouldn’t have made intellectual or technological progress as fast as we have, without it. This entry was posted in Paradigmeers on October 31, 2011 by dave5621. If I were to ask you to name famous Finns, you might struggle. However, there are few more accomplished performers or greater Paradigmeers than Finnish Olympian Paavo Nurmi. Born in Turku, Finland in 1897, Nurmi was known as one of the famous “Flying Finns.” During the 1920s, he was recognized as the greatest middle and long distance runner in the world. He set forty world records for all distances between 1500m and 20km and competed in three Olympic games from 1920 to 1928, winning nine gold and three silver medals. Today, Paavo Nurmi is considered a Finnish national hero and an idol to many. Incredible achievements for sure, but this does not make him a Paradigmeer; it was the way he changed sport, forever, that puts him high on our list. Any sportsperson today, whether a casual runner, footballer or gym user, will be familiar with sports science. The use of training programmes is universally recognised as an important way of improving athletic performance. In Nurmi’s day, athletes just raced. Turn up and run. There was no concept of training, no understanding that the body was able to adapt and improve. He was one of the first top athletes who had a systematic approach in training. Walking, running and calisthenics were the main elements of his harsh training regimen. He learned to measure his pace and its effects with a stop watch. When Nurmi started using a stop watch in all his training runs, he broke the mould. How many of us today run, cycle, swim, train with a stop watch to time our efforts? His significant achievements resulted from tireless hard work and a truly dedicated individual character. Through his achievements and his scientific approach to training and racing he transformed competitive running in the 1920s and opened people’s minds to the improvement of human potential through purposeful training. This entry was posted in Paradigmeers on September 15, 2010 by dave5621. I can’t be bothered to remember significant numbers. I even have to look up my mobile phone number. However, there is one number that has been indelibly printed in my brain, 19517. This is the number I had to give to the shopkeeper every time I was sent to the local co-op to buy groceries for my mother when I was a child. A share of the Co-op profit, the dividend, was allocated to each member according to how much they spent in the shop over the course of the year. My mother and all our neighbours would go on an annual pilgrimage to the store to collect their ‘divi’, along with all the other members in the area. I thought this quaint (though cruel from the child’s perspective) practice had died out until I moved to Wooldale and for £1 joined the local Co-op founded in 1886, where you still quote your number and they write it on your till receipt. In the true spirit of the co-op number I have also committed this sacred numeral to memory. They captured the radicalising mood of their time and soon other Co-operatives, like the Wooldale Co-operative, were springing up across the country. These principles changed the world forever, not only for consumer retailing but as a model for bringing a social conscience and an ethical stance to business. As such, the Rochdale Society of Equitable Pioneers fulfil all our current criteria as exemplars of Paradigmeering. For those who are interested visit www.wooldale.coop to see how these principles are still very much alive today. This entry was posted in Paradigmeers on August 25, 2010 by dave5621. Our Paradigmeers have shown they are people who think differently about how to bring fundamental change to people’s lives. They have considered how the prevailing rules have stopped people making further steps toward improvement. In many cases they conceived of the inconceivable. We can all dream. How many of us are great inventors, designers, and coaches with a ground breaking idea? How many of us have the mindset which will make our vision become reality? If we are Paradigmeers then we believe we can ‘make it so’! If not it is yet another unrealised pipe dream. Without opportunity nothing can happen, but like a sparrow on your window sill, it may be there every day – did you notice it? Paradigmeers create opportunities. They become aware of a need to make something happen. Maybe they don’t set out to find an opportunity to improve their world but something in them triggers the recognition that things could be much better. Would Napoleon have risen to be Emperor of France if he hadn’t aged 24, seized the opportunity to shine as an artillery officer at the siege of Toulon in 1793? If there had been no war at the time he is unlikely to have had the chance to show his talents and his name would have been consigned to obscurity. Even with opportunity many Paradigmeers will have fallen by the wayside because they couldn’t gain support. Clive Sinclair’s C5 is a great example. His previous products like the ZX Spectrum computer struck the right chord and were a massive popular success. Whereas, the world wasn’t ready for the C5 personal transport. 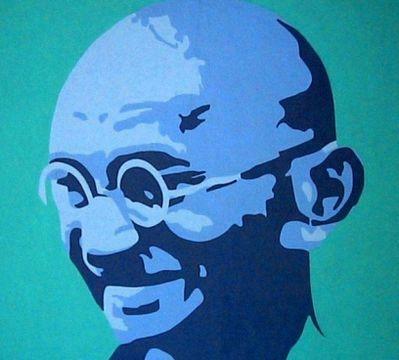 If Ghandi had been a fire-brand revolutionary would he have been as successful in bringing independence and democracy to India? Violence was simmering with ethnic tension throughout the country yet by and large his influence brought about a peaceful transition or certainly a more peaceful change. This raises the question; can we create the conditions for opportunities to arise? If we can then Paradigmeers can thrive. If you are to make your dreams become reality and bring about fundamental improvements, how can you capture the spirit of the day to gain support? Or what qualities are needed to overcome adversity so that others too can realise what might be achieved and become followers. This entry was posted in Paradigmeers on June 29, 2010 by dave5621. To be considered as a Paradigmeer, it is necessary to show that a person has truly influenced a transformation. Most historical leaders do not feature; they are merely creatures of their time, bent on maintaining their position. Napoleon Bonaparte took the opportunity offered by the French Revolution to transform the whole of Europe. His legacy still prevails today. Napoleon Bonaparte was born in 1769 in Corsica. Through his military exploits and his ruthless efficiency he rose from obscurity to become Emperor of France. Set in the context of his time when states were ruled by monarchs many of whom believed they were descended from God and held the position by right. Your position in society was determined by your birth with no possibility of improvement, regardless of education, enterprise or hard work. Religious tolerance was at the whim of the ruler and the Pope. The revolution had swept this aside in France, the rules had been changed. In the rest of Europe Rulers stood ready to forcefully suppress any such challenge in their countries. While Napoleon didn’t initiate the revolution he was very much a son of it. He will be remembered as a military commander, he was brilliant, and acknowledged as such by his peers, including Wellington. Even so, his ambition led to his demise as the French army was driven from Russia with terrible losses. Perhaps his greatest legacy is the foundation of civil administration he laid across Europe. His intention was to build a federation of free peoples in a Europe united under a liberal government. In the states he created, Napoleon granted constitutions, codes of law, abolished feudalism, created efficient government and fostered education, science, literature and the arts. Under his rule he granted freedoms including religious tolerance and the abolition of serfdom. ‘Nothing is more difficult, and therefore more precious, than to be able to decide. Perhaps these denote some of the characteristics of a Paradigmeer? This entry was posted in Paradigmeers on June 14, 2010 by dave5621. Mention Eddy Shah to people and you get a mixed reaction. In 1983, as the owner of a print works in Warrington in Northern England he was at the centre of one of the most bitter industrial disputes seen in the UK. As the owner of six local newspapers he was determined to use modern technology (desktop publishing) to print them, this meant breaking the monopoly of the print-workers supported by their Trades Union to operate the print machinery. The newspapers and magazines of the time were written by journalists on their typewriters and their words were either typeset by using hot metal to create a printing plate or by operating computers to set the page. The traditional technique was highly skilled work and required a seven year apprenticeship. The workers were in short supply because they restricted the number of apprentices; as a result they had great power and commanded high wages. During the dispute there were times when 10,000 people were picketing Eddy Shah’s premises. This was a protest not only against the threat to the print workers livelihood but also against the new labour laws which restricted the right to strike. After seven months the dispute came to an end and the way was paved for newspapers to be printed using modern technology. Rupert Murdoch went through a similar dispute in January 1986 as News International moved print operations from their traditional home in Fleet Street, to modern, purpose built, highly automated premises in Wapping. It could be argued that the transformation of the UK newspaper industry could have been achieved in a more co-operative way. However, when established practices become intractable and the rules become immovable it becomes highly risky to get to the next level. Eddy Shah took the risk, showed great determination and ultimately allowed the printing industry to develop. He was a Paradigmeer of his time. This entry was posted in Paradigmeers on June 7, 2010 by dave5621. Without Freddie Laker and his Skytrain flights to New York which started in September 1977 we may not have the budget airlines of today. Until this point air travel was enjoyed by the rich, with luxury flights on National carriers being the norm. Freddie Laker challenged this dominance with Skytrain offering a ‘turn up and go’, no frills service at a fraction of the price of other airlines. It had taken him six years to get the first flight off the ground such was the opposition arrayed against him. Freddie Laker changed the rules. Air travel could be for everyone, it didn’t have to be a luxury, taking a flight could be like catching a train. The paradigm shifted and now budget airlines rule the skies. National Carriers offer: Routes into major international airports, full service, large baggage allowance, a range of booking options and luxury travel. Budget Airlines offer: Flights into regional airports, the option to buy ‘extras’ such as food and additional baggage separately, online booking as the primary customer interface and budget travel. Freddie Laker found that his dream of opening up air travel to more people by making it accessible had to overcome huge opposition. It wasn’t as if people didn’t want the service, they were desperate to use it, the market was there. But like many Paradigmeers he had to take on powerful groups who felt threatened by the improvements he was advocating. Eventually they proved too much for Skytrain and they stopped trading in 1982. One of the characteristics of Paradigmeering is the necessary struggle that has to occur in order to change the rules. This entry was posted in Paradigmeers on May 31, 2010 by dave5621.